Robert Murray McDonald, was a son of blacksmith Hugh and Devina (nee Munro) McDonald of 110 Huron St., Embro. He left school after his fourth year in Continuation School at Embro and moved to Toronto where he apprenticed as a pharmacist. He completed his education at the University of Toronto and graduated in 1940. He and his brother Tim enlisted with the Royal Canadian Air Force and Bob trained in Montreal as a radio and radar mechanic. In December 1942 he shipped out to Scotland, a trip that introduced him to seasickness, even in light seas. He spent most of the crossing in sick bay, where it was discovered he also had appendicitis. In Scotland, where he spent all of his war years, he scanned for enemy planes heading out to attack the North Atlantic convoys. He used his leaves to explore the countryside and to travel to London, England, and hook up with his Embro pal Symons (Sy) Muir. 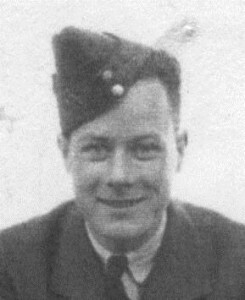 In the RCAF, Bob’s surname was incorrectly spelled “MacDonald.” Although the war ended in May he was not demobilized until December 5, 1945, as a Leading Aircraftman. While in uniform, he and a fellow serviceman, named Williamson, bought a pharmacy in South Porcupine (now a part of Timmins) and Bob moved there shortly after returning to Canada. In 1947 he married Violet Dillon who was from South Porcupine and together they raised 5 sons - Sandy, Paul, Mickey, Phil and Bruce. The original store was sold and Bob moved to a new location in South Porcupine without Williamson. Over the years the pharmacy was moved and expanced and eventually became the only one in town. In 1983 Bob retired and his youngest son Bruce bought the drug store.